An interesting story in the lore of Thunder Butte country is the tale of the ranch dog who went to Hollywood. In 1930, a local cowboy named Ger Orvedahl began training a six week old puppy in the finer arts of helping out around the ranch. Tuffy was a quick learner and over time developed an extensive repertoire of really interesting tricks that he could perform when Ger employed various hand signals and voice commands. Ultimately, Tuffy learned to recognize by name and fetch many household and ranch implements. Later, Ger got the idea of showcasing Tuffy's talents by putting on a show in Faith, about 1932, where Tuffy would fetch various objects and lead a horse down the street. Local residents were so amazed at Tuffy's talents that Ger decided to take Tuffy to Hollywood in 1935. Daredevils of the Red Circle (1939). Tuffy's film costars included numerous famous actors of his day such as Henry Fonda, Fred MacMurray, Buster Crabbe, and Jack Luden. Tuffy left Hollywood in 1941 after an illness on the set of the film, Brigham Young (1941), but continued giving shows and making appearances until 1946, when he died at 16 years of age. 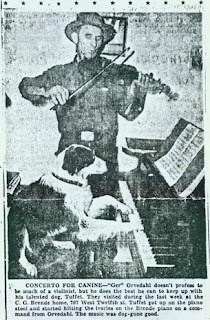 Ger Orvedahl continued to train and perform with dogs until his death in 1954 in Illinois. Ger published his dog training wisdom in the book, The Orvedahl Method of Training a Puppy, in 1950. The Orvedahl family maintains a website devoted to the story of Ger Orvedahl and his Hollywood wonder dog, Tuffy, here. Ger is pictured with one of Tuffy's successors, Tuffet, below.